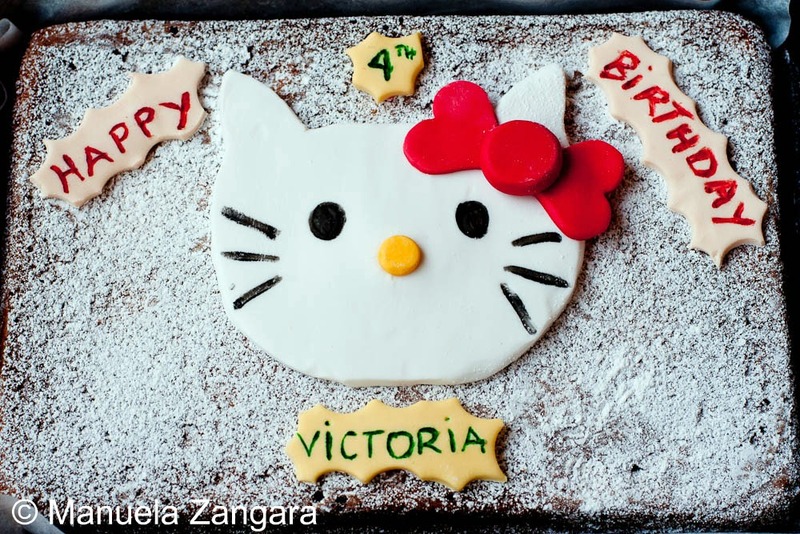 As I had already made the Hello Kitty cake pops, I thought of using the same theme for Victoria’s school birthday party. I really did not have a lot of time for this cake. I literally baked it from scratch on Sunday night after the party we had at home (and I had been in the kitchen all morning assembling the Triple Salted Caramel Cupcakes, the Chocolate and Raspberry Mini Cupcakes, baking Focaccia, Focaccia con le olive and Focaccia di Recco)! So, as you can imagine, I was TIRED! But this is such an easy cake to make! I used a simple yogurt cake as a base (I made 1 ½ dose) and decorated it with icing sugar and fondant. The cake is a basic yogurt cake. I just flipped it upside down, to get the smoother side on the top and I sprinkled it with icing sugar. 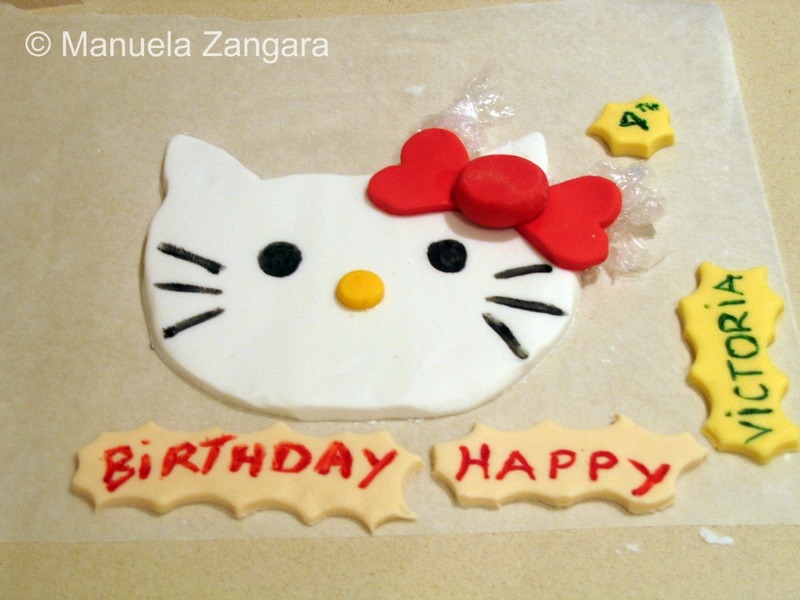 To make the Hello Kitty decoration and the rest of the decorations, I used coloured fondant and edible ink pens. To make Hello Kitty’s face, I rolled out some white fondant and I cut out a square. Then I cut out the ears from inside the square and “rounded” the face. I did this all using a sharp knife and pretty much by hand. To make the bow, I rolled out some red fondant and cut 2 hearts with a cookie cutter. I also made the center of the bow with a slightly flattened fondant ball. For the nose, I made a little yellow flat fondant ball. Then I drew the eyes and whiskers with a black edible ink pen. 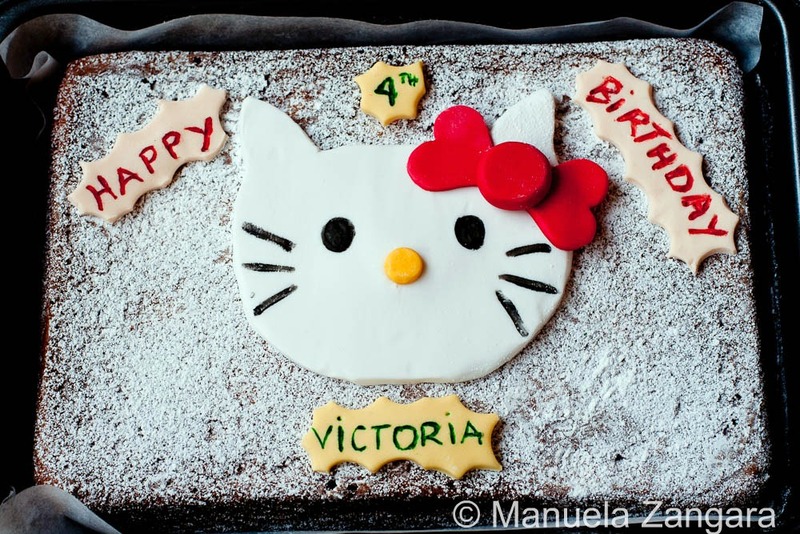 Then I used some more colored fondant and edible ink pens to write “Happy 4th Birthday Victoria”. To shape these, I simply used one side of the heart cookie cutter. To attach the fondant decorations to the cake, I used a little bit of icing. 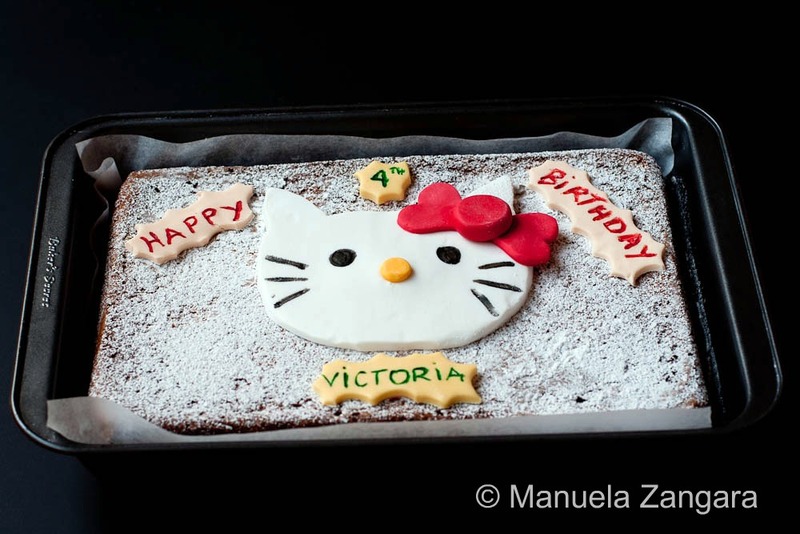 Victoria was so lucky for this birthday cake. Will have to do this for my youngest’s next month. Amazing, Manu! GAHdorable! I bet all of Victoria’s friends just went nuts over this cake 🙂 And if this is what you make when you’re tired?…girl, you put the rest of us to shame! Buzzed!!! Looks fabulous! Who knew you were also a cake extraordinaire! 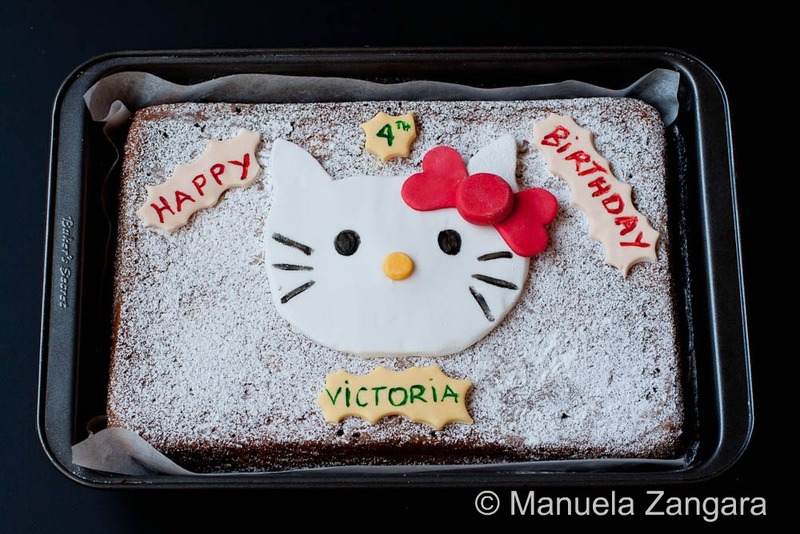 That’s such a cute birthday cake… awesome job Manu! What a lucky girl..this looks so cute! I think I will have to make for my daughter’s B-day too! Such a super nice birthday cake…Manu! Great great great job….Super mom!